April 24, 2017 April 23, 2017 / Elizabeth T.
Pink is definitely a feminine color, and sometimes, lighter shades can even elicit a more youthful and girly vibe. With today’s sporty trends, though, even this soft blush tone can be elevated for a more androgynous look that radiates with elements of athleisure chic. As you’ve probably seen from one of my outfits a few weeks ago, colored denim is one of my favorite springtime trends. During the fall, and especially the winter, darker denim can help to streamline the legs for a sleeker look that’s perfect for knee-high boots. In the spring, though, lighter jeans, particularly colored denim, gives a more youthful and fun vibe, especially in a blush tone, the perfect color for the warmer weather! To balance the perfect touch of sporty chic in the midst of a pink color palette, adding elements such as strategically placed stripes, classic white sneakers, and timeless sunnies help to curate a look that is girly yet fun and perfect for a spring day. One of the most convenient ways to add stripes to this ensemble is through one of the hottest jacket trends in the recent years – bombers! Not only are they comfortable and super cute, the silhouette adds a certain element of old-school prep to a sporty outfit. The stripes on the collar, sleeves, and hem match perfectly with the stripes on my sneakers, bringing the whole look together for a pink ensemble that’s girly yet sporty. 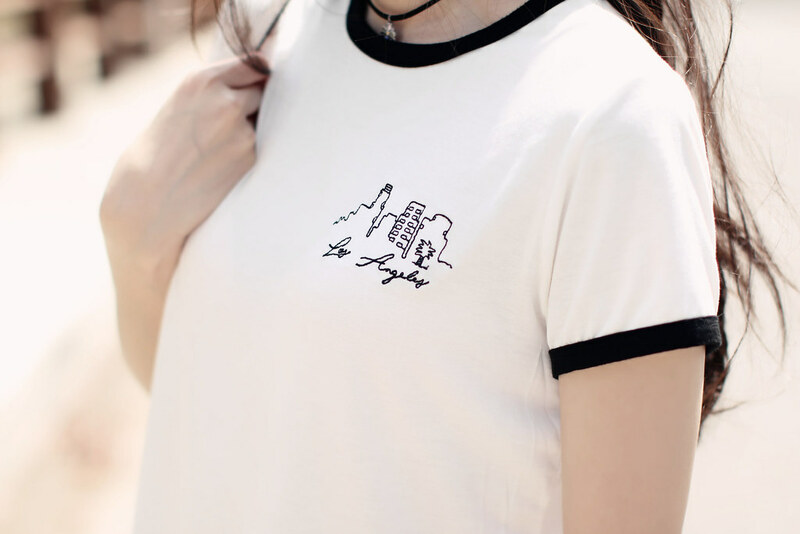 To finish off the whole ensemble, I stashed on my favorite pair of sunnies to match this “Los Angeles” cropped tee for a laid-back and casual SoCal girl vibe. Love this casual chic look! Especially that super cute tee! In love with the colors in these photos. You looking great in casual look! I am totally loving blush pink right now- it’s such a gorgeous color and like you said, youthful. Sporty-chic looks are killing it, and your bomber is stunning! Thank you so much Amy ❤ You're too sweet! 🙂 Hahah and yes, the youthful factor is something I really love about this color! So love this look and the color theme…. Sucha sweet and candy look! You are so pretty! Hahah yes, I love the bomber jacket too Tiffany! ❤ 🙂 Hope all is going well for you too! Have a great week! Great post! Love your jacket! Your outfits are always so cute and casual! I love your simple graphic tee here. It looks great with your super adorable pink bomber jacket! Loving the light pink colour right now! The pink color is so lovely on you! I love wearing blush pink in the Spring! This blush bomber is so cute! I love it! Really love your look, especially the pink and the jacket! Love that white tee. Bad that it is sold out. Your bag is classic. I really like the bomber jacket – I think it ties everything together. I don’t wear pink much since my school uniform was pink – however it always makes me look younger! Thank you so much love ❤ You're too sweet! 🙂 Haha and yes, pink definitely adds youth to just about any look! Love this outfit!! SO incredibly chic and the pop of pink with the bomber is perfect!! I am so happy I came across your blog because your style is fantastic! Dreamy photo’s as usual! I’ve become a little obsessed with the shade pink recently in everything & not just because it’s Spring! But I’ve never thought about a pair of light pink jeans, these are are so lovely. The whole look is feminine and Spring inspired, whilst still keeping it casual which I love! I also love how you tied in the stripes on your shoes with the cuffs of your jacket, that’s some serious coordination right there! Sport vibes with pink! Love it!! Great outfit! Loving that graphic tee! I Love this casual dress Your outfit is amazing. I am totally loving your light pink paint and white shirt. Thank you so much for sharing this nice lovely post. Loving the color of your bomber babe! So spring and summery! Blush is my favorite color! I love how minimalist your outfit is 🙂 super cute! White sneakers are so versatile! Love this pair and the way you styled them! Yes, I love how versatile they are ❤ 🙂 Thanks for stopping by love!